San Francisco Bay is under threat from polluters every day. 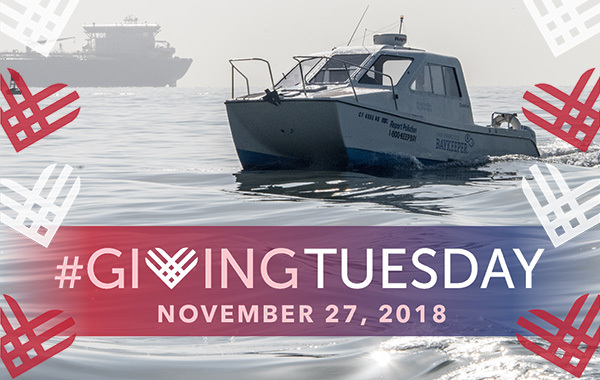 Fortunately, you can have a big impact defending the Bay on Giving Tuesday this year! Facebook has a simple fundraising tool that you can use to support Baykeeper’s critical work protecting the Bay from the biggest threats. Plus, you’ll have twice the impact. PayPal is matching up to $7 million for Facebook fundraiser donations made on Giving Tuesday, November 27. Make sure to set up your Giving Tuesday Facebook fundraiser ahead of the day itself. Lots of people think about their charitable donations around Thanksgiving—consider setting up your fundraiser for Thanksgiving weekend, with a message of gratitude for San Francisco Bay. Choose an amount: enter a total amount you want to raise that is suitable for your network. Most people set a goal of $250-$1,000. Set a deadline: We suggest keeping the fundraiser open for a few days prior and after Giving Tuesday to give your Facebook friends time to respond. I support @SanFranciscoBaykeeper because I see the good work Baykeeper is doing at a local, targeted level, holding polluters accountable and protecting San Francisco Bay. Please join me in supporting Baykeeper’s work on behalf of the Bay for #GivingTuesday! Photo: You can use the default Baykeeper cover photo that will pop up, or replace it with a photo that represents why you want to protect the Bay. Create: Click the “Create” button to publish your fundraiser. After publishing your fundraiser, make sure to periodically repost it to your news feed to request donations. Remind people about the fundraiser in the days leading up to Giving Tuesday, and on the day itself: Tuesday, November 27. That’s it! If you have questions about fundraising for Baykeeper, please email info@baykeeper.org.